Khandvi is Gujarati delicacy made using Gram Flour/Chickpea Powder and flavoured with tempering of pungent mustard, spicy green chillies, sweet coconut grates and aromatic coriander leaves.One of the favorite snack in my family. I learnt to make Khandvi, also called surali chya vadya in Marathi, from my neighbour, a popular Gujarati snack which is quick, easy, and also low-fat. The best part was to cut them into thin stripes and roll them without much fuss!! 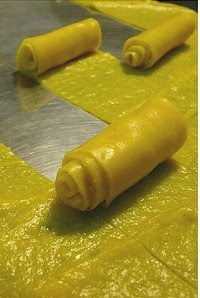 Whenever I make Khandvi..Yes, I did it and I feel like I am on top of the world . Here I proudly present fluffy, soft, melt in mouth and delicious Khandvi. 1. Sieve the besan and keep in a bowl.Grind ginger and greenchillies, grease the reverse side of a few thalis . 2. Make buttermilk with yogurt and water. 3. Mix the besan with ginger, greenchillies, salt turmeric powder, lemonjuice and buttermilk.Take care that ther are no lumps. 4. 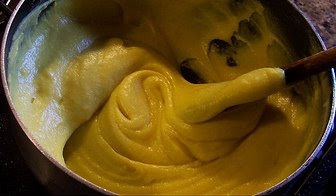 Cookthis mixture over fire till thickens into a thick batter.stir constantly. 6. When cool roll the layer towards you and cut into 1” pieces. 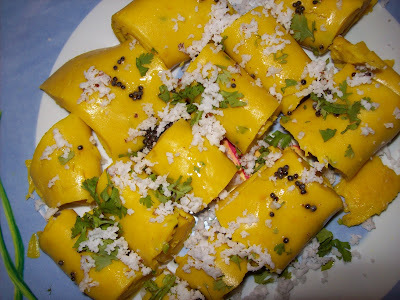 wlow .. khandvi looks soo delicious .. i just love khandvi .. Thank you suma for encouraging me with yr lovely comments. looks yummy and very delicious.